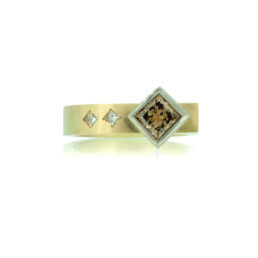 Bespoke ring in 18k yellow Fairtrade gold designed and handmade from scratch. The ring is set with a dark champagne diamond (0.56ct, 4.5mm x 4.5mm, C5/6 colour), which is responsibly sourced from © Origin Australia. 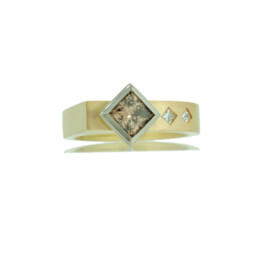 Two colourless princess diamonds are also set flush onto the surface of the band.